Seven is bringing back some of its most popular international shows in the week of May 4. Loyal Boston Legal fans (I know how patient you’ve been!) are rewarded with a higher profile timeslot, beginning 9:30pm Monday May 5. In the episode “Beauty & The Beast” John Larroquette, Christian Clemenson, Tara Summers and Saffron Burrows join the regular cast. It is followed by UK journalist Louis Theroux, known for his outlandish interview subjects, at 10:40pm. Theroux has previously been seen on pay TV. The second season of Ugly Betty will air at 7:30pm Wednesday May 7. “How Betty Got Her Grieve Back” guest stars Illeana Douglas. My prediction? Ugly Betty will have low ratings, or no ratings at all. Viewers watched the first season of it for several weeks before they all said “Nah”. How do I know that this situation will not be repeated? 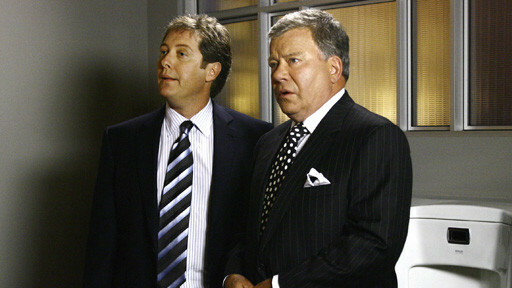 Boston Legal is brilliant,but will it be able to capitalise on DH?